Thank you for visiting Hilton Head Breakers Vacation Rentals.com. 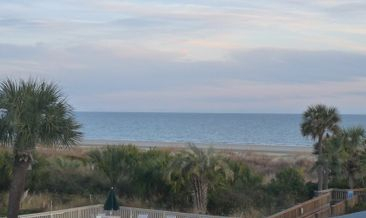 Hilton Head oceanfront condos, owned and maintained by local owners - Rick and Vickie Silbaugh. Vacation Rentals by Owner or VRBO for short. We own, rent and maintain our own Hilton Head Oceanfront Vacation Rentals. We have two Hilton Head Island Oceanfront Condos available for vacation rentals, Hilton Head Breakers #240 and Hilton Head Breakers #221. Our oceanfront rentals are located on the south end of Hilton Head Island on 4 North Forest Beach Drive; this is a favorite spot for couples and small families to spend their Hilton Head Vacations. You do not have to drive or walk to the beach, you are already there; the ocean is right out the door. If you are looking for a clean, well-maintained Hilton Head vacation rental, look no further, both our oceanfront condos, Breakers #240 and Breakers #221, were renovated and are in great condition. We live on Hilton Head Island SC, right off of North Forest Beach Drive "our favorite area', so we are able to make sure our Hilton Head Vacation Rentals are clean and well-maintained. We personally inspect both our rental properties prior to each arrival, insuring our guest a wonderful, enjoyable stay. Being local owners enables us to update our villas regularly. The majority of our guests are repeat renters, if they need to contact us during their stay; we are just a phone call away! 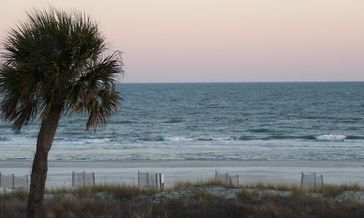 View Photo Albums of both our oceanfront vacation rentals, Hilton Head Breakers #240 and Hilton Head Breakers #221. To see if your desired rental dates are available, view our availability calendars. If the desired rental dates are already reserved, let us know and we will contact you in the event of a cancellation. If you would like more information on one of our oceanfront condos, View Hilton Head Breakers #240 and Hilton Head Breakers #221. If you would like more information on reserving one of our oceanfront condos, view the rental rate chart and rental agreement. Hilton Head Breakers is a small, quiet complex, there are only 120 condos, perfect for a relaxing vacation. During your stay, you will enjoy one of Hilton Head Islands widest beaches and most desirable locations. You may not need to use or move your car, dozens of restaurants, shops, grocery stores and attractions are within walking distance. Right across the street at Coligny Plaza, there are quaint little shops, entertainment, restaurants, grocery store, coffee shop, movie theatre and bakery. If you like biking, there are miles of bike paths right out your door. The biggest attraction to Hilton Head Island South Carolina is our beautiful, wide beach and its hard packed, white sand, ideal for sunbathing, riding bikes, jogging, shell hunting and romantic strolls. All types of water sports are available, including windsurfing, parasailing, jet skiing, boating, fishing, etc. There is something for everyone to do, horseback riding, waterslides, miniature golf, arcades, theatres, playgrounds, tennis, championship golf courses, dinner cruises, fishing charters etc. Another big attraction on the island is Harbour Town, you will definitely want to put that on your list of things to do, it is not far from the Breakers. If you like biking, there are miles of bike paths right out your door. View our Hilton Head Vacation Guide for links to information on Golf Courses, Tennis Courts and Activities for kids, Bike Rentals, Dinner Cruises, Dolphin Cruises, Fishing Charters, Water Sports, Special Events, Festivals and more!